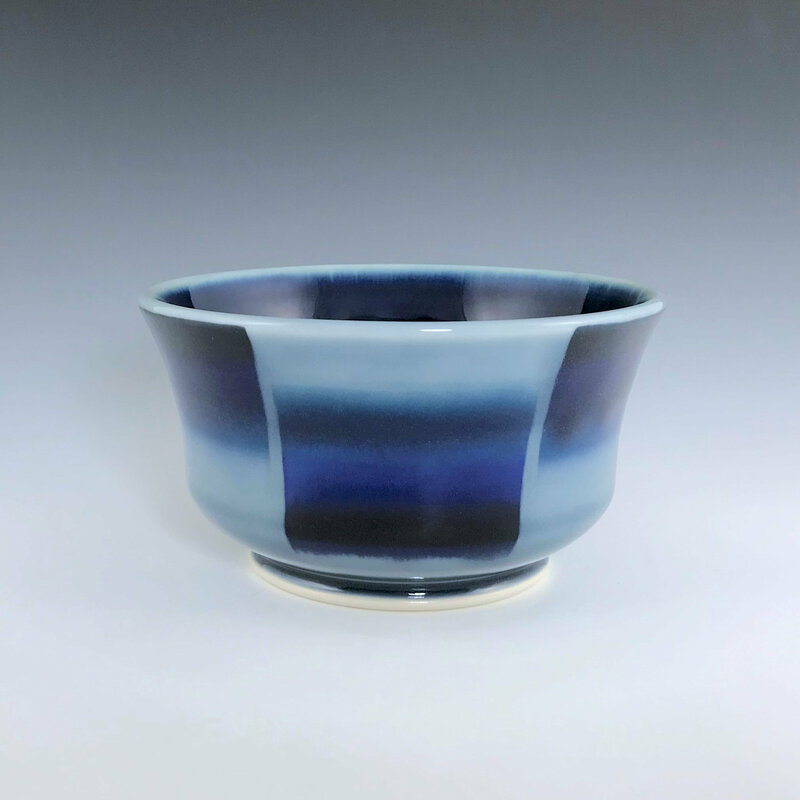 Porcelain soup bowl or cereal bowl with a blue ombré exterior and a dark blue interior. It is a great size for serving salsa, dips, or a side dish. Use it as a candy dish or a display piece. Size: Height 3", Diameter 5 ¾" . It is microwave and dishwasher safe. This listing is for one ceramic bowl. Other pieces pictured are listed separately, if available. Each ceramic bowl is handmade individually and there may be slight variations in size and glaze patterning. There are six hand painted ombré patterned panels on this bowl. As shown in the images, the ombré pattern runs in the opposite direction from panel to panel. I made this bowl on a potter's wheel using high-quality porcelain. The ombré pattern is hand painted using underglazes. I mix my glazes from scratch using only non-leaded ingredients. The final glaze firing reaches 2,232°F ensuring that the pot is safe for use with liquids/food and can be used in microwaves and dishwashers.